The word was out. The hunt was on. Rosetta rolls were in. Rosetta rolls, were the latest thing to plant them selves in my head. An idea that jiggled around like a salsa dancer with funny itch. Ok, maybe not quite like that, but the seed had been planted. I wanted to make rosetta rolls. Those crusty little Italian rolls in the shape of flower, quite often hollow inside, and if my memory served me correctly more than moderately delicious stuffed full with prosciutto and fresh mozzarella. Once an idea implants itself within, it’s pretty hard to shake off that salsa dancer with the funny itch, so I sent out a call for help. The Bread Goddesses (Celia and Joanna) heeded the call and the hunt began in earnest. Not much longer than 48 hours after the call had gone out and I had a press in my hand. Now that was surprisingly quick for something at the start of my search seemed completely futile, and that clearly I would have to travel to Italy to go and find my own bread stamp. I was certainly willing…sometimes these kind of things just need to be done. First batch I did a sourdough version and a yeasted version. For shaping both kinds of rolls. I divided the dough into 8. Flatten quickly, then pulled the corners into the middle, with the idea of trapping as much air as possible. Flipped it over and gently tightened it all by using a pushing action going under the roll and spinning it around. On to tray and used the wonderful little stamp dipped in a little vegetable oil. Baked at 240C with lots of steam. Second go, and I didn’t bother with the yeasted ones, life is a whole lot nicer with sourdough. The same ingredients and quantities as the first batch but this time substituting 100g of the flour for semolina. This using a little rye flour with the stamp on top to hopefully stop the bread for joining again after using the stamp. Any difference between the oil and rye with the stamp formation? Not noticeably. Some of the bread rolls had joined a little and some kept the perfect markings. With the addition of the semolina, I’m not sure yet. I think I’ll keep tweaking the semolina and bakers flour ratio though. Anyone else willing to heed the call of the rosetta?…Or simply have a salsa dancer with a funny itch of an idea? 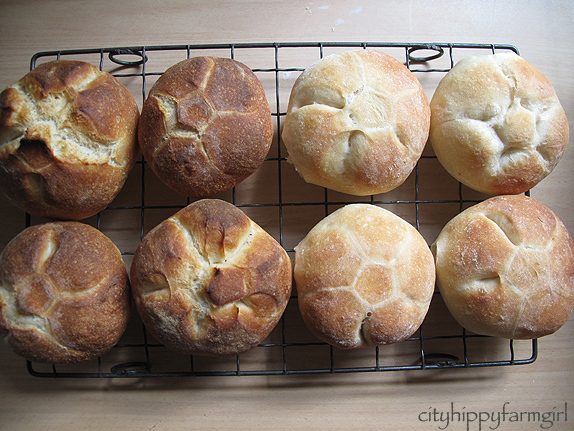 This entry was posted in Baking Bread and tagged bread rolls, brotchendrucker, brotchenstampel, kaiser rolls, rosetta roll stamp, rosetta rolls, semolina by cityhippyfarmgirl. Bookmark the permalink. Seriously, I know loving a piece of plastic is odd, but I do, I do! 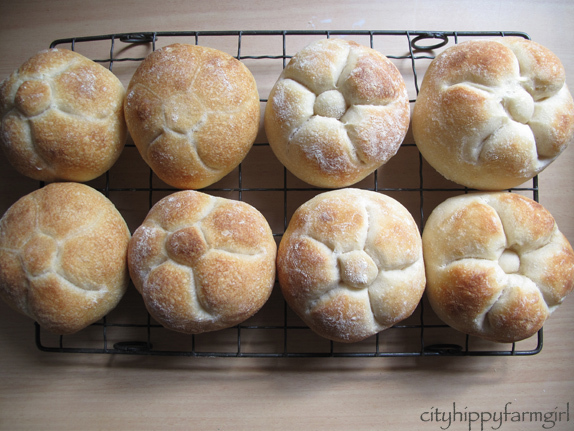 i don’t have a st vitus dance itch in my head but i do have a serious dose of rosetta roll envy..they look so delicious i want one now please..i can see i need one of those stamps too to make these gorgeous rolls so the quest is on for me now.. I hope you get one! I think they were definitely worth it. You really should open a gourmet bakery:) I’d by these! I often daydream of my bakery name…. YUMMO – I could so go one of those rolls for lunch. They look absolutely delicious! They’re perfect rosetta’s, and this would bring back many an Italian memory, maybe fresh mortadella and warm crusty rosetta’s on today’s pranzo menu? Wow these look perfect Brydie – well done! I love the crazy rosetta quest. I am sure it will continue to spread. I nearly asked Celia to get me one of those stamps as well and then decided to try and get that semolina dough working first (not had much success so far). And my sourdough mojo is in low ebb…a few too many disasters…even the chooks and dog are probably thinking “please, give it a rest ok…or just use some yeast…even we can’t tackle those bricks”. But the rosetta quest might be just the thing to get me going again. Nothing like a quest to rise you above and beyond! I think you’ll need to find a different reason to visit Italy 🙂 Clearly, you didn’t need any Italian help here, and they look picture perfect. Ok. I was going to wait a while before trying out some of my toys- but you have inspired me to give them a try- maybe by the end of the week. I will be making doughnuts! 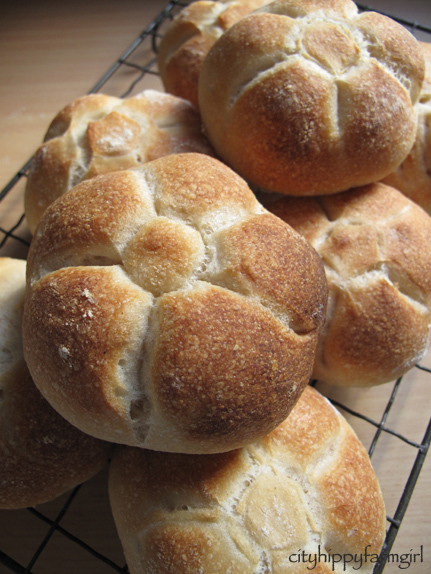 Love the beauty of your rolls- wishing I could enjoy the actual flavor and toothsome texture! These are gorgeous and you always have the best analogies. These look beautiful. All posh! There would have to be loads of these little beauties in Germany, I say stock up while you are there young lady. Joanna who is linked in the post just got hers from Germany yesterday. Me either a week ago. You had me at sourdough! Sourdough is the bees knees isn’t it. Brydie, those are stunning. How long did the rolls bake? Around the 15-20 minutes mark Misk. Depends how golden you want them, and lots of steam! A dish at the bottom of the oven with water, plus squirter of water initially in the crack of the door and again about 8 or so minutes in. Oh. those. sourdough. rolls. Oh! They look divine. I want to gently pull apart & melt a pat of butter in the middle, and slide into heaven. My son is going to italy today.. i will set him on a hunt for a bread press thingy. i had NO IDEA that they used those.. I love learning new stuff! thank you! 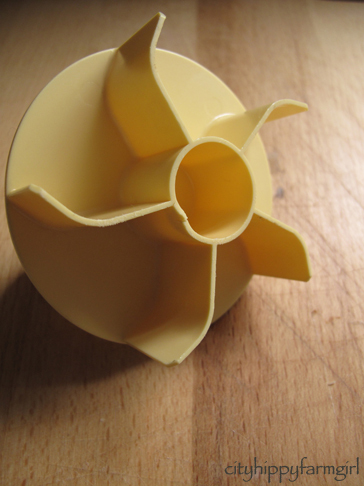 Now if I could just get my hands on one of those nifty mould thingies. You, Celia and Joanna are such bad influences on me. My bank balance really won’t thank you for this post…. but I might! Watch this space is all I can say. Yummy – I’m thinking you could home deliver some of these to have with some delicious spicy garlicky chorizo that I have happily chanced on. Go on, send some my way. This is just to let you know that I have passed on some bloggy love to you today. Please head over and have a look. Yum!! 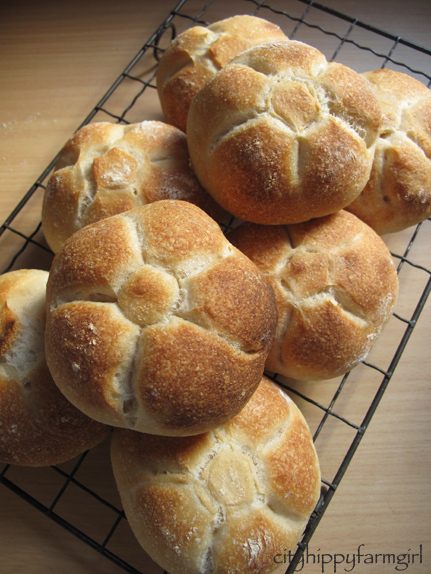 My son and I have been experimenting with the perfect pizza dough, but those rolls are seriosly talkin to me!! You have some magical abilities, those look amazing! I need to mix up my bread repertoire, it is getting a bit boring. I need to jump on the sourdough train!